17.8.1920: Launched by A. 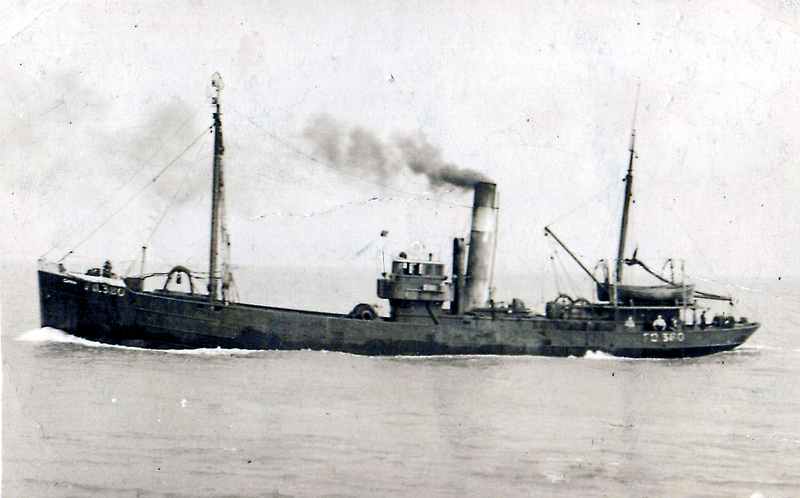 Hall & Co Ltd, Aberdeen (Yd.No.579) for The New Docks Steam Trawling Co (Fleetwood) Ltd, Fleetwood as GAVA. 12.10.1920: Registered at Fleetwood (FD380). 10.1920: Completed (Joseph A. Taylor, manager). 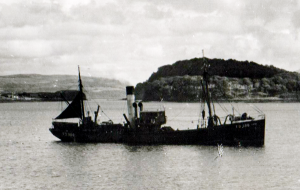 16.7.1932: Laid up for 36 hours NEbyW of St. Kilda with leaking boiler tubes and water in the stokehold. Effected temporary repair and returned to Fleetwood. SEA SWEEPER (FD171) in radio contact. 20.10.1935: Off Barra, assistance rendered by Barra Island lifeboat LLOYD’S. 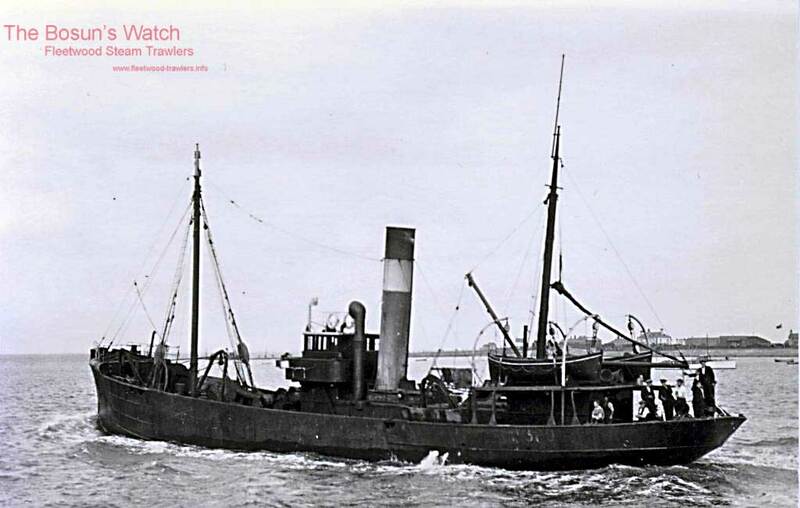 17.2.1939: Sold the The Clifton Steam Trawlers Ltd, Fleetwood. 27.11.1939: Requisitioned for war service and appointed for boom defence duties. Pre 4.1940: Employed on Fishery Protection (WA/Fort William/Fleetwood). 26.5.1940: At 6.57pm. ‘Operation Dynamo’ (Dunkirk evacuation) put into effect. 27.5.1940: Sailed Fleetwood for English Channel, requisitioned for war service as an anti submarine trawler (P.No. 4.14 ) (Hire rate £83.10.6d/month). As Leader (Sk. F. Day), in company with DHOON (FD438), EDWINA (FD205), EVELYN ROSE (GY9), JACINTA (FD235) and VELIA (FD49). 1.6.1940: At Dunkirk (Sk. F. Day) sailed at 12.24 pm with French troops embarked. At 1.05 pm stopped ship, crewmen, A. Munn, H. Gawne and J. Jones dived overboard to rescue three wounded French sailors. At 6.30pm. at Ramsgate landed 160 troops. (transported 502 troops in total not confirmed). 2.1942: Fitted out as a minesweeper. 9.1942: Engaged in target towing. 6.1946: Reclassed at Liverpool and returned to owner. 22.2.1949: Took WILLIAM MANNELL (LO370) in tow after refloating from stranding at Glengad Head, Co. Donegal. 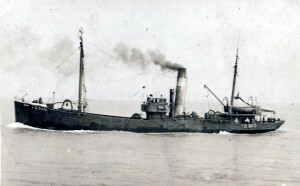 WILLIAM MANNELL sank under tow 21/2 miles E of Dunmore Head off Portaleen, Co. Donegal; crew saved. 1.11.1950: Sold to Stroud’s Steam Fishing Co Ltd, Aberdeen (George D. W. Stroud, manager). 30.3.1951: Registered at Aberdeen (A676). 1954: Horace E. Stroud appointed manager. 1956: Went ashore on the Pentland Skerries; part crew rescued by motor fishing vessel ENTERPRISE (WK229). Refloated and towed to Lyness. 1959: Sold to B. J. Nijkerk S.A., Antwerp for breaking up. 26/01/2009: Page published. 3 updates since then. 09/07/2017: Removed FMHT watermarks from images. This entry was posted in Steam Trawlers, Steamers (Picture) and tagged Clifton ST, New Docks STC on January 26, 2009 by Fred Smith.